1111 & 1115 E. Iron Ave. The Norton Apartments are adjacent brick apartment buildings designed and built in 1926-1928 by developers Frank C. Norton and Willis B. Crowther. 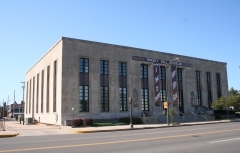 The buildings are locally significant as representatives of Salina’s growth and expansion in the 1920s. 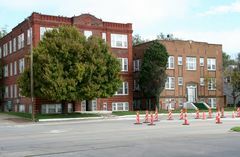 Low-Rise Walk-Up Apartment Buildings, including the Norton Apartments, addressed the city’s expanding population and housing shortage following World War I. 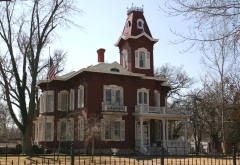 This new building type provided efficient use of land in locations already served by public infrastructure and provided multiple dwelling units in a common setting with similar amenities to compete with single family homes that were in short supply in Salina as well as other communities across the nation. 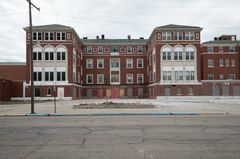 The Roosevelt-Lincoln Junior High School property is comprised of two historic school buildings separated by a restored green space. 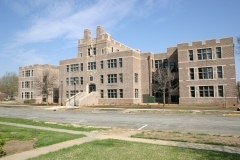 Architect William T. Schmitt designed Lincoln School in the Prairie style and was constructed between 1915 and 1917. Charles W. Shaver designed the Roosevelt School in the Gothic Revival style. It was constructed between 1920 and 1925. Shaver was issued the professional architect license number one in Kansas following his graduation from KSU in 1915. 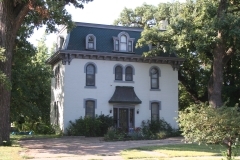 The property is nominated as part of the Historic Public Schools of Kansas multiple property submissions in the area of Education for its history as a junior high school. St. John’s Hospital is an excellent example of an early twentieth century private hospital that incorporates the architectural features and interior configuration of the block plan property type. The block plan developed in the early twentieth century in direct response to the challenges faced implementing earlier pavilion plans. The four-story, Y-shaped Italian Renaissance design developed in 1914 communicates the staid, reliable, and authoritative role of the hospital while the interior plan reflects the organization of various departments in a single building, in keeping with national hospital design trends of the time. The four-story 1951 addition is a continuation of earlier design trends in its massing, materials, and interior configuration with more Modern finishes. The 1957 addition completes the 1951 design. Important features of the block plan property type that remain intact at St. John’s Hospital include the wide double-loaded corridors that define the footprint of the building, wings for separate departments, and small rooms that line the corridors designated for patients or hospital functions. 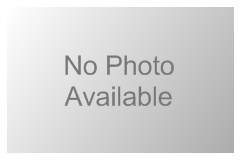 National Register listing is pending.